Drop-in replacements for factory components enhance reliability and optimize the performance of your M&P for different applications. Installing the Competition Kit yields a smooth, consistent, trigger pull of slightly less than 3 lbs., with shorter over-travel and faster reset than a factory-stock M&P. Retain the factory sear spring to get a slightly heavier 3½ lb. pull. Designed for IDPA, USPSA, Steel Challenge, 3-gun, and similar types of action shooting competition. Not for duty, carry, or self-defense applications. Duty/Carry Kit delivers a smooth, consistent 5½ lb. trigger pull with less over-travel and shorter reset. Improves performance of your pistol while maintaining its safety features for daily carry. Retain the factory sear spring to get a slightly lighter 5 lb. pull. Both kits engineered for a drop-in fit, though gunsmith installation is recommended. SPECS: Kits include hard sear, Ultimate Striker Block (see below), two sear springs (different sizes), and trigger return spring. 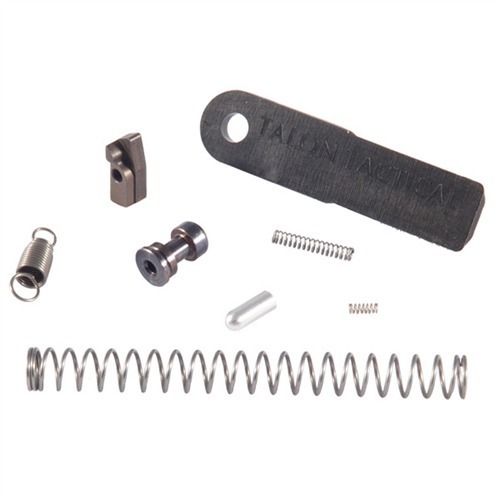 Duty/Carry Kit also includes competition striker spring and aluminum slave pin for installing trigger return spring. Competition Kits are for competition use only – NOT FOR DUTY/CARRY or SELF-DEFENSE APPLICATIONS. After the Comp.install you will notice a cleaner,smooth trigger pull,and shorter return.The hard sear and striker block safety alone change this weapon from plain o .45 to something ppl will envy after pulling off just one round!Not to mention a sub 3 pound pull.Well worth the $$. My custom work on the striker block and sear did not hold a candle to the kit. I've had the pleasure to attend S & W, H & K and Beretta armorer courses and have worked on handguns nearly 40 years; this kit is worth every penny. I cannot believe what a difference the 45DCAEK kit made in my M&P 45. We are talking night and day difference. The install videos are great as well. Install was fairly easy. Do be careful when doing the sear, my spring went flying, fortunately I was able to locate it with the help of a big magnet. Would certainly recommend. was easy to install but I do not think it changed the trigger pull enough to make it worth while. This kit improves the M&P trigger so much that it feels like a new pistol. My M&P9 has been taken to a whole new level with this kit, and if you have the M&P I really suggest you invest in this kit it is a must have. Easy to install and there is a step by step tutorial posted on you tube. I only wish I bought this sooner. I was really thinking about a glock 17 because of the M&P trigger but not anymore. I just installed the DCAEK in an M&P9, and I can say that I am very impressed; every bold claim happy customers have made about his products have proven to be true. The relatively horrible OEM trigger that was handicapping an otherwise viable service pistol has been made obsolete. The Apex DCAEK'd M&P is a 'no-excuses' gun. I highly recommend this kit! I have a moderately used M&P Pro 9mm that I "compete" with in local matches, so I figured a 9c was a logical carry gun. It came through with the worst trigger I could imagine, like pulling a cat off a screen door by the tail. I installed the DCAEK and the 9c now has a better trigger than my Pro. I am going to install a kit on the Pro ASAP. Hands down, if you own an M&P and want a short, moderate weight, smooth as glass trigger with a short short reset - then get an Apex DCAEK. Check the You Tube instructions first. The kit comes with useful tools to help with the install of the various parts(aluminum temp retaining pin for the trigger return spring and the plastic dove tail tool). The parts are drop in and the results are great. This is the best trigger carry kit I have ever used. It was easy to install and use. It also worked will to reduce the amount of reset of my carry M&P357. I recommend this for any one who carries an M&P on duty or concealed. Smooth and crisp after install 20 rds at 25 yds., my one flier was inside the 6 ring. While the install was easy after a couple of takes at you-tube, a 1 page instruction and parts list would have come in handy. Well worth the effort. After reading all of the reviews before determining which kit to purchase, I settled on this kit. The reset was shorter and the creep was almost nil. The resultant trigger pull was approx. 5.25#. I also purchased another kit without the new trigger spring, and installed it in a customer's firearm. The results were similar, but the trigger pull was approx. 4#. The trigger spring supplied is actually heavier than the original spring. Easy to install, great performance, and a great upgrade for my M&P pistol. This trigger kit is an excellent upgrade. I had very little trouble installing it after watching the videos from apex tactical on youtube. A must for every M&P owner. I installed this myself using the included tools and a sight pusher. It's a fairly simple process but it does involve manipulating some small parts. I found my tweezers came in pretty handy. I've had around 4000 trouble-free rounds through mine in two M&P9s. I did a two day pistol class consisting 1200 rounds without cleaning. Both kits have been completely safe and reliable. I've also done well in some low level competitions with it. The DCAEK it provides a much better trigger pull. It turns the only real deficiency of the M&P and turns it into a strength. I'd describe it as a light Glock style pull with a period of pre-travel with a more distinct break than a stock M&P trigger. In my opinion this is the type of trigger that should have come in the pistol from the factory. I'd also suggest installing the Apex RAM to further improve the reset. This kit is cheaper than many of the analogous Glock kits available from other companies and the parts are very high quality. I kept this kit intact and changed all Apex asked and over all it is a really great upgrade. I am better staying on target and can get follow-up rounds-down-range quicker. It is just so smooth and fine now. This trigger is carry ready and is very positive. The only down side came in the install. It was ths "slave pin" that came to make the trigger spring install "easier". That pin seemed about 1/8th of an inch too small. I could never get it set up and prepped to get the real pin to push in and make it lead out. I ended up putting a punch through the other side: grabbed the spring with tweezers and placed it over that punch and went through to the otherside of the frame. Then I could follow through with the pin and get it set up right. Wasted 10 minutes to figure that out...but well worth it!! I bought a M&P 9c for concealed carry. The gun shoots very well, and I am more than pleased with the level of accuracy. The only thing that could be improved upon was the trigger, which was gritty and had a weak reset with a good bit of creep. After some research I found Apex Tactical. Buy this kit with Reset Assist kit and the Fail Safe Extractor, and you will be amazed! The trigger is now smooth and crisp with a little over five pounds of pull, and an audible, tactile reset. I installed the entire modification in approximately one hour, no fitting required. I have full faith in this firearm as a concealed carry piece, and have no doubt about the modifications adding to the accuracy and durability of the gun. If you have an M&P, buy these kits and find out just how good this gun can be! This kit solves all the problems with the factory set-up for trigger pull and reset. My M&P40 now has a clean, crisp 4.5 pound triggerpull and crisp reset. I also purchased the competition springs for changeover and use in IDPA matches, but have not used them because this "duty" set is just so good. If you own a M&P pistol, I highly recommend purchasing and installing this kit. This trigger turned my M&P 9 from a good pistol to a great pistol! all of the parts are replacements for factory ones, so no fitting or grinding was involved. The only downside is that you have to remove the rear sight. Realigning just takes a little time and patience to get correct. The stock M&P is a great, reliable pistol with a terrible trigger. This kit basically is a new sear profile that moves the trigger break back to near the trigger stop. This eliminates a lot of the overtravel and makes the gun much easier to shoot accurately. The kit also has some different springs to make the pull slightly lighter and put more tension on the trigger pull. This is good because although the trigger breaks farther back - the total travel is the same. This gives you about one-half inch of soft slack before a brief stack and a reasonably good break. Its no 1911, but its light years ahead of the stock trigger. I installed mine in about an hour after watching the recommended youtube videos. it was pretty easy. I had to do some stuff twice but it was easy. The M&P is a simple gun and the only trick part is solved by the slave pin for the trigger spring. Anyone with any real skill could do this in about 15 minutes. I started out with a gritty 6.5 pound trigger pull. I left the original sear spring in (I had the small one) and ended up with a nice 5.25 lb pull (measured on my fish scale) which is perfectly consistent. After I was finished I wondered how a big, and good, company like S&W had let the currrent stock trigger go into production when some easy improvement like this is possible. I highly reccomend this trigger kit! The only part I didn't like on my Smith & Wesson M&P 40 was the factory trigger. From the factory it is long, gritty, and a sluggish pull. A co-worker had a local gunsmith do some trigger work on his M&P and it ran him $120. After doing some reading on several forums I decided to go with the Apex kit. I installed it today and took it to the range along with my buddies M&P. The apex kit took all the grittiness out. It now has a clean crisp break, and a quicker reset. This kit is well worth the price. Install was fairly easy. Took about 45 mins. Only tools I needed was a Hammer, Punch, and Allen Wrench. I felt that my pistol's trigger pull was a little smoother than my buddies M&P (Gunsmith trigger job). Because the trigger was a littler lighter and smoother I was able to contraoll my follow up shots easier and inprove my accuracy. Overall I am very Satisfied with this kit and would suggest it to anyone. Found it very easy to install, and I am someone with very little DIY ability. The rear sight came off with very little effort to install the USB. The pin holding the sear assembly was a tough nut to crack but came out after some good whacks. Be sure to cover your punch with masking tape or something that will not hurt the finish of the gun. Trigger is no longer gritty at all, has a nice crisp break with greatly reduced reset. Gone is the 'false reset' that I felt on the gun. Trigger is also significantly lighter, which can be made heavier by the use of the trigger reset spring included. Great product, have it installed on my 45 too. I have and M&P 40. The trigger upset was HORRIBLE. I installed the DCAEK myself (relatively easy with the videos and the right tools) and there is absolutely no trigger upset now. I do recommend installing the RAM as well, as the reset is not good on the M&P. Although the RAM (reset assist mechanism) is not available in the police store, the DCAEK makes the M&P a great pistol, making the poor factory trigger great. If you don't have the right tools and have not worked on firearms, I would seriously think about having a gun smith instal it for you. First I tried the old trick of polishing the friction surfaces in the factory trigger linkage with only minor improvement. Then by chance I stumbled on the Apex website. I reserched reviews,went to Brownells and ordered it. I'am very impressed with the improvement. It eliminated almost all of the gritty/spongy feel in take up. The front sight twitch on the trigger break is gone,and the reset is more positive and noticeable. Very glad I purchased this kit! Installed the kit by myself in about 20 minutes thanks to the Apex YouTube videos. Huge difference in the trigger pull immediately apparent: all grittiness gone, pull lighter, break cleaner, reset crisp (I also installed the Apex RAM). I was a bit skeptical at first but this kit delivers exactly what it promises and anyone with the most basic of mechanical skills and tools can install this kit (watch video). If in doubt - refer your gun to a qualified gunsmith. This kit combined with the aluminum trigger left me with the single best striker fired trigger I've ever encountered and one that rivals many SAO triggers as well. Money well spent! I was not happy with the trigger pull and reset on my M&P 9mm. After the install the trigger pull is lighter but the most notable change is in the trigger reset, much more definite than before. My accuracy is much better now with this kit, I did not change the trigger, if I had it to do over I would have changed that as well. Hated my M&P full size 9mm pistol because of the very heavy trigger pull. Yep could shoot it but shots were all over the place so it sat in gun safe. Purchased this kit and took to local gunsmith to have installed for safety reasons ( no experence with triggers at all) and now it is a smooooth trigger pull and about a 4.5lb trigger pull a huge difference like a totally different pistol. The pull is so much smoother and lighter and has a nice defined breaking point and a short reset just makes this kit a MUST DO to your M&P pistol from the start.. First time out just wowed me best I ever shot this pistol with best 5 shots at 3 inch bulleye from 10 yards was 4 bulleyes and 1 about 2 inches off bulleye for somebody that has only been shooting for 14 months. Watch the video that Apex has on their website as this will greatly diminish any difficulty you may have during installation. Most difficult parts are installing the trigger return spring and aligning the module pin holes. The trigger module was the hardest for me as it shifted around when trying to reinsatall the factory pin. Use a good pin punch to keep things aligned as the little pin they give you was actually a problem for me as it kept getting stuck inside the trigger elements. It is too short in my opinion. The results are worthwhile, though, as the trigger pull is now under 3 lbs. instead of 5.5. This is the second kit I installed and the first one was a snap. I didn't use their little pin the first time. I left the trigger pin partway in and stretched the new trigger return spring onto the trigger pin and had no alignment problems. Hope this helps. Received the kit today, and installed it right away. Not too hard, but find the apextactical videos on youtube to help you out.To remove the front sight to install the USB I put the slide in a vise, and used a piece of hardwood to not mark the slide, worked great.Installed one piece at a time and tested the trigger each time, and every piece made a difference.Went to the range today, and what can I say but WOW, my groups were tighter from 10 yards to 20 yards.Can stress this enough, if you have an M&P install this kit and you'll fell like you have a different gun right away. Absolutely the best upgrade you can do! As an owner of an M&P, you know it is a great handgun. installing this kit makes it sensational. DO IT NOW! Installed the Apex Tactical Competition Action Enhancement Kit in my M&P 9mm. I went from a gritty, 6lb trigger to a smooth as silk 2lb 9oz trigger. I did not mix and match Apex and S&W springs. Trigger weight is exactly as advertised. The trigger almost floats back to the point where the sear is engaged, and once engaged the trigger breaks like a glass rod. It's smooth and crisp, and VERY predictable. If you have an M&P that you use as a range or competition gun, you NEED this kit. This is how my M&P should have come from the factory. The small changes all add up to a wicked mod. If you follow the videos posted on YouTube by Randy from APEX then you wont have any trouble installing this, i have absolutely no experience in smithing but i managed to get this installed in less than an hour and haven't had any problems with it since. Bottom Line: If you own an M&P you should own this kit. One thing to note, this is the Competition Kit so the trigger pull is very light, if you are going to use this for Duty/Carry do all the innocent kids in your area a favor and get the Duty Carry Kit, it has a slightly heavier pull which should help you to avoid shooting the cat next door. fairly easy to install. Watch the videos a few times and you will have no problem. The kit says it comes with two sear springs but only use one.... it came with one, also it came with what looks like a firing pin spring but does not say anything about it in the discription. Put about 120 rounds down range so far with no problems. I think i might reinstall the factory sear spring because the trigger pull is almost too light. Overall great kit and simple to install. This is the icing on the cake. Kit springs and parts combine to give the M&P a very positive trigger feel with clean, light take up and clean, smooth, light, trigger/sear break. Easy to install, inexpensive. Makes a grungy trigger pull like butta. I put this kit in my full sized .40 that I have had for a while. The gun was pretty decent before but nothing really serious to write home about. This kit brought my M&P to life! There is no more twitch from the trigger pull because there is no more over travel, it has a smoother quicker reset. It is borderline to light though, when they say competition only.... They mean it. Apex not only has improved the M&P Trigger it has open a whole new world for Shooters that have Arthritis, Osteoporsis or loss of finger strength. By using the Apex Competition Actino Enhanceent kit. you can Adjust or vary trigger weights for those that have a hand related disability. Plus for the competition shooters their product base put the M&P in a Class By it's self. By Interchanging factory and Apex springs you can Make your Duty Gun a Competition firearm with a sub 3LB Trigger and Change it back to a 5 to 7 lb Duty trigger in less tahn then 30 minutes I have been able to change the lives of several shooters that could not handle the original Trigger Pull and get these people back into the best Hobby out there. The M&P is a Great Pistol Apex Tacticle Makes it Better. Great improves trigger feel and operation. Also installed the RAM. Feels like a good match trigger, not 1911 race gun trigger but close enough. Got it installed by a gunsmith. Thanks Apex and Brownells for supporting IDPA shooters in South Africa. Časť - Výrobcovia: 100072 856008005192 Drop-in náhrady za továrenské komponenty zvyšujú spoľahlivosť a optimalizáciu výkonu M & P pre rôzne aplikácie. Inštalácia súpravy do súťaže prináša plynulé a konzistentné spúšte o niečo menej ako 3 lbs. s kratšie nadmerným cestovaním a rýchlejšie obnoviť ako továreň-skladom M & s. zachovať továrne sežehnout jar získať mierne ťažšie 3½ lb. vytiahnuť. Navrhnuté pre IDPA, USPS, oceľ Challenge 3-gun a podobné druhy akcií střelecké súťaže. Nie pre clo, carry a Sebaobrana použitie. Cla/niesť Kit zaisťuje rovnomerné 5½ lb. spúšte menej nadmernej cestovanie a kratšie reset. Zlepšuje výkonnosť pištole pri zachovaní jeho bezpečnostné prvky pre každodenné nosenie. Udržať továrne sežehnout jar získať mierne zapaľovač pull 5 lb.. Obe súpravy navrhnuté pre drop-in hodí, aj keď Puškár Inštalácia je odporúčaná. Časť - Výrobcovia: 100060 856008005079 Drop-in náhrady za továrenské komponenty zvyšujú spoľahlivosť a optimalizáciu výkonu M & P pre rôzne aplikácie. Inštalácia súpravy do súťaže prináša plynulé a konzistentné spúšte o niečo menej ako 3 lbs. s kratšie nadmerným cestovaním a rýchlejšie obnoviť ako továreň-skladom M & s. zachovať továrne sežehnout jar získať mierne ťažšie 3½ lb. vytiahnuť. Navrhnuté pre IDPA, USPS, oceľ Challenge 3-gun a podobné druhy akcií střelecké súťaže. Nie pre clo, carry a Sebaobrana použitie. Cla/niesť Kit zaisťuje rovnomerné 5½ lb. spúšte menej nadmernej cestovanie a kratšie reset. Zlepšuje výkonnosť pištole pri zachovaní jeho bezpečnostné prvky pre každodenné nosenie. Udržať továrne sežehnout jar získať mierne zapaľovač pull 5 lb.. Obe súpravy navrhnuté pre drop-in hodí, aj keď Puškár Inštalácia je odporúčaná. Časť - Výrobcovia: 100073 856008005208 Drop-in náhrady za továrenské komponenty zvyšujú spoľahlivosť a optimalizáciu výkonu M & P pre rôzne aplikácie. Inštalácia súpravy do súťaže prináša plynulé a konzistentné spúšte o niečo menej ako 3 lbs. s kratšie nadmerným cestovaním a rýchlejšie obnoviť ako továreň-skladom M & s. zachovať továrne sežehnout jar získať mierne ťažšie 3½ lb. vytiahnuť. Navrhnuté pre IDPA, USPS, oceľ Challenge 3-gun a podobné druhy akcií střelecké súťaže. Nie pre clo, carry a Sebaobrana použitie. Cla/niesť Kit zaisťuje rovnomerné 5½ lb. spúšte menej nadmernej cestovanie a kratšie reset. Zlepšuje výkonnosť pištole pri zachovaní jeho bezpečnostné prvky pre každodenné nosenie. Udržať továrne sežehnout jar získať mierne zapaľovač pull 5 lb.. Obe súpravy navrhnuté pre drop-in hodí, aj keď Puškár Inštalácia je odporúčaná. Časť - Výrobcovia: 100062 856008005093 Drop-in náhrady za továrenské komponenty zvyšujú spoľahlivosť a optimalizáciu výkonu M & P pre rôzne aplikácie. Inštalácia súpravy do súťaže prináša plynulé a konzistentné spúšte o niečo menej ako 3 lbs. s kratšie nadmerným cestovaním a rýchlejšie obnoviť ako továreň-skladom M & s. zachovať továrne sežehnout jar získať mierne ťažšie 3½ lb. vytiahnuť. Navrhnuté pre IDPA, USPS, oceľ Challenge 3-gun a podobné druhy akcií střelecké súťaže. Nie pre clo, carry a Sebaobrana použitie. Cla/niesť Kit zaisťuje rovnomerné 5½ lb. spúšte menej nadmernej cestovanie a kratšie reset. Zlepšuje výkonnosť pištole pri zachovaní jeho bezpečnostné prvky pre každodenné nosenie. Udržať továrne sežehnout jar získať mierne zapaľovač pull 5 lb.. Obe súpravy navrhnuté pre drop-in hodí, aj keď Puškár Inštalácia je odporúčaná.